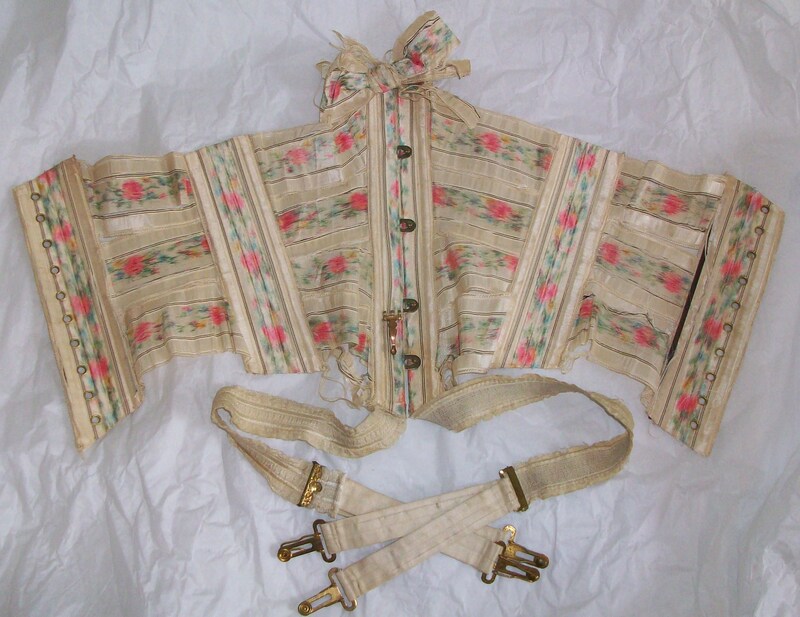 This ridiculously pretty garment is a ribbon corset, dating c 1900 – 1905. Two lovely ladies brought it to the premiere performance of ‘Silk’ at Macclesfield Silk Heritage Centre. It was presented to History Wardrobe as a donation. I’ve long had a ribbon corset on my costume ‘wish list’ but I never thought to see one for sale, let alone to be gifted such a beautiful example. As my photographs show, the silk ribbons are lightly bound in horizontal fashion, with metal eyelets at the back for lacing, and minimal boning. The corset sits under the bust and barely grazes the lower ribs. It cinches the waist but not the hips. Two very long suspenders would hold up milady’s stockings, using elegantly-wrought metal suspender clasps. Chine silk was very popular in the 18th century, then revived in the 1890s and early 1900s. The silk of this corset has shattered in places, and there are some frayed edges. Sturdier examples survive in some collections, usually of cotton. They were intended to sportwear, especially cycling, offering greater freedom of movement than the full S-bend corsets, or the sheath-like Directoire styles which followed. To be fair, most women would be too ‘stout’ to wear it, even when it was in a sturdier condition. 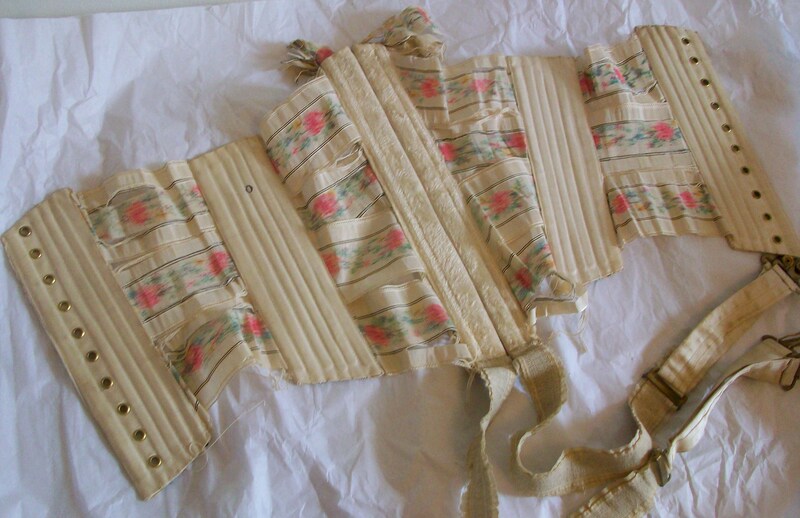 Essentially, such dainty ribbon corsets were not intended to correct or confine curves too emphatically. They were frivolous items for a slender, leisured woman, to be worn under a cobwebby confection of silk and lace known as a tea gown, or with lingerie in the privacy of the boudoir. This example measures a mere 20 inches from edge to edge. Naturally, it need not have been laced utterly closed. There could have been several inches ‘spring’ at the back. 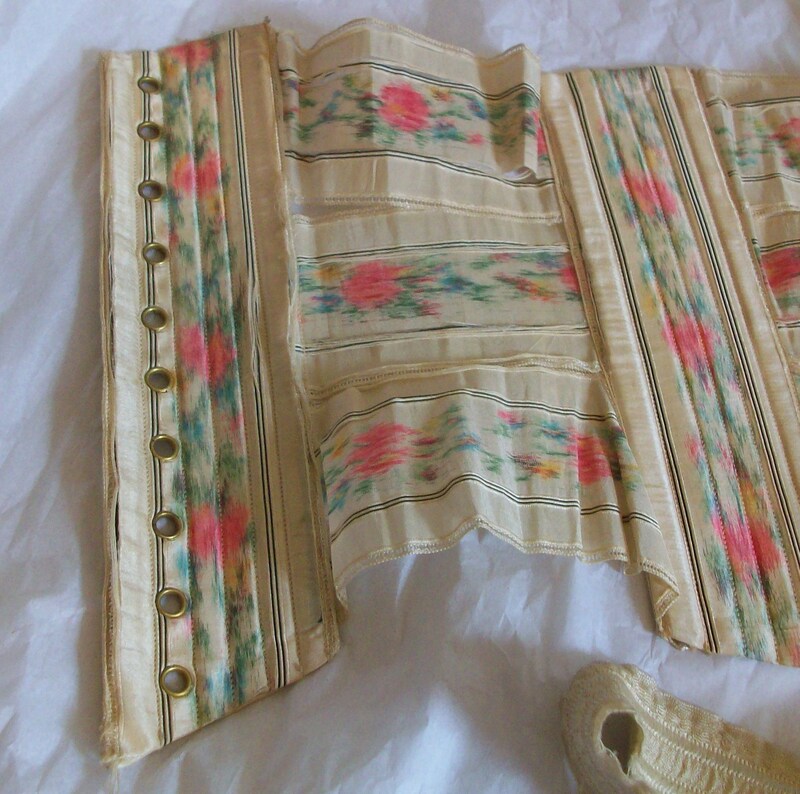 The corset is now nestled in acid-free tissue paper and will be on show in the History Wardrobe presentations Silk and Votes for Women. 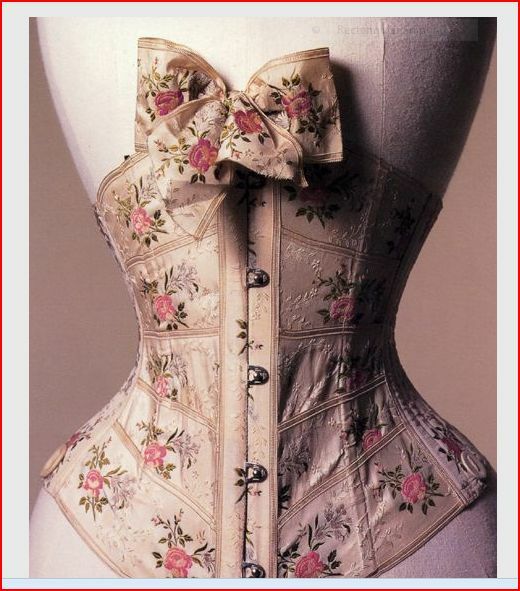 For modern corsetieres there are several online tutorials for making your own ribbon corset. By happy coincidence one of the visitors to ‘Silk’ at Macclesfield was just about to start this very project, and was thrilled to see an original example.